Judy Finelli, a female juggler and a major player in the New Circus Movement, finds herself losing the ability of her limbs and thus her ability to perform. Eventually diagnosed with multiple sclerosis, Finelli must find the will to continue and fight her own struggles. With only a few pieces of fabric, some balls, circles, and a whole lot of imagination, Finelli’s brightly inspiring tale breaths life on the stage. With no dialogue to speak, Reverse Cascade requires the audience to read the Director’s Note to fully grasp the evening's event. Without the knowledge of the story, it’s likely you may be lost in the action. But knowing the basics, it helps when Fitzgerald and her extraordinary puppeteers give Judy Finelli shape. In order to keep the focus on the objects and not the performers, Fitzgerald has her team dawn black from top to bottom, including face coverings. Whether it be the available lighting or the necessity of positioning, it takes some time before the bodies melt away into the darkness. But once they do and it’s all about the puppets, Reverse Cascade is smile-inducing. Though the piece is short and sweet, there are beats that are bit slow and repetitive. Finding ways to pump up the energy will help the piece as a whole. Perhaps that comes in finding new moments or eliminating non-essential beats, either way Fitzgerald could benefit from some tightening of the elements. 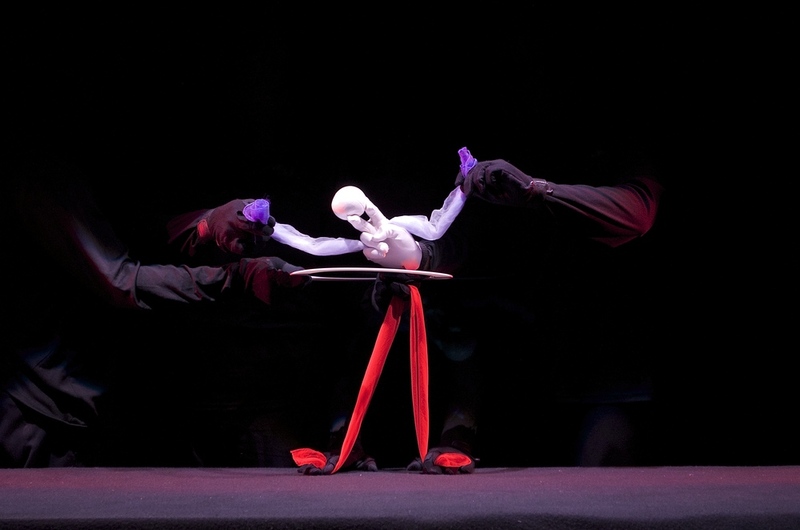 While it’s near impossible to decipher who is operating which item, the puppeteers as a unit moved as one, knowing the choreography that makes the piece take flight. Comprised of Fitzgerald, Emily Hall, Sophie Hinderberger, Moira Horowitz, Sarah Nolan, and Jeanine Padgett did an exceptional job. But the real unsung hero of the evening is the live music performed by ellen cherry and composed by Michael Albaine and Nicholas Trautmann. The underscoring makes Reverse Cascade. There would just be something vacant without it. Reverse Cascade is a reminder that anything is possible in theater. You don’t need words to understand. Just a vivid imagination and the willingness to let your mind wander to another world. While Anna Fitzgerald could tighten up her piece, Red Ball Theatre Company is onto something remarkable.